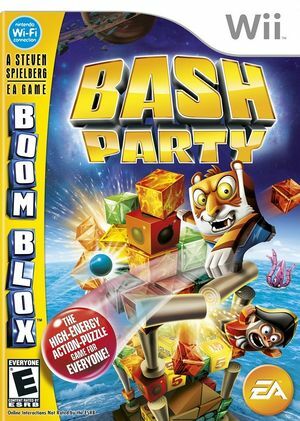 Boom Blox Bash Party, known in Europe as Boom Blox Smash Party, is a physics puzzle video game developed by Amblin Interactive and EA Los Angeles in conjunction with film director Steven Spielberg, and published by EA for the Wii. Like it's precessor, Boom Blox, it is a physics based puzzle game, the objective being either to keep structures made of blocks from being knocked down or to knock them over by various means. Bash Party features a new slingshot mechanic; reducing the need for the shooting mechanic from the first game. The game includes new environments (such as underwater and outer space), new block shapes (such as cylinders and ramps), more multiplayer modes, and online multiplayer via the Wi-Fi Connection. Current revisions hang before gameplay with Dual Core enabled, showing 0FPS and 60vps. Turn it off and the game will work normally. The graph below charts the compatibility with Boom Blox Bash Party since Dolphin's 2.0 release, listing revisions only where a compatibility change occurred. This page was last edited on 23 July 2018, at 20:17.